Atami’s B’Cuzz Grow contains 100% organic, concentrated plant stimulators for hydroponic reservoirs or soil. 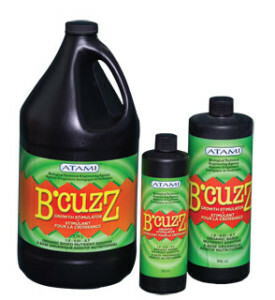 B’Cuzz Grow fortifies and protects plants from heat, dry air, pests, diseases, and nutritional inadequacies. This nutrient enhances micro-biological life in root zone and accelerates metabolic processes.